UNITED STATES DISTRICT COURT WESTERN DISTRICT OF WASHINGTON AT SEATTLE. Case No. Download "UNITED STATES DISTRICT COURT WESTERN DISTRICT OF WASHINGTON AT SEATTLE. Case No." 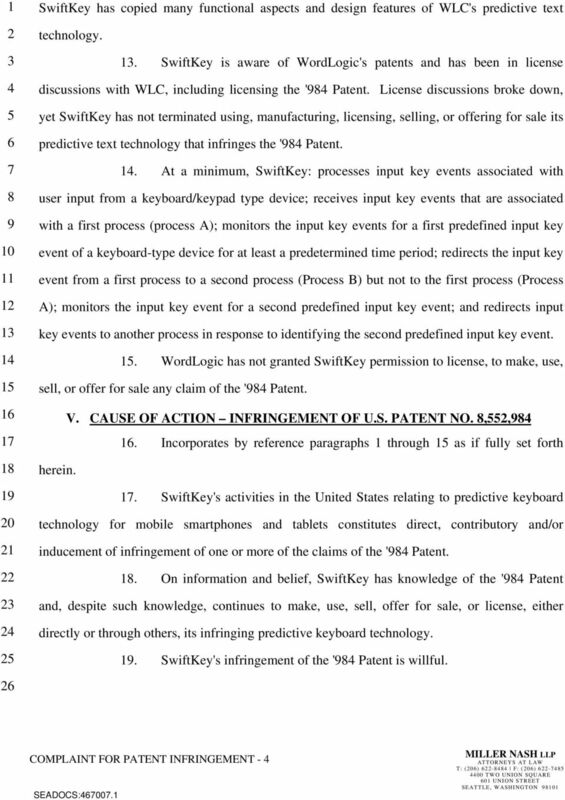 Case 1:99-mc-09999 Document 92 Filed 03/02/10 Page 1 of 16 IN THE UNITED STATES DISTRICT COURT FOR THE DISTRICT OF DELAWARE APPLE INC., vs. 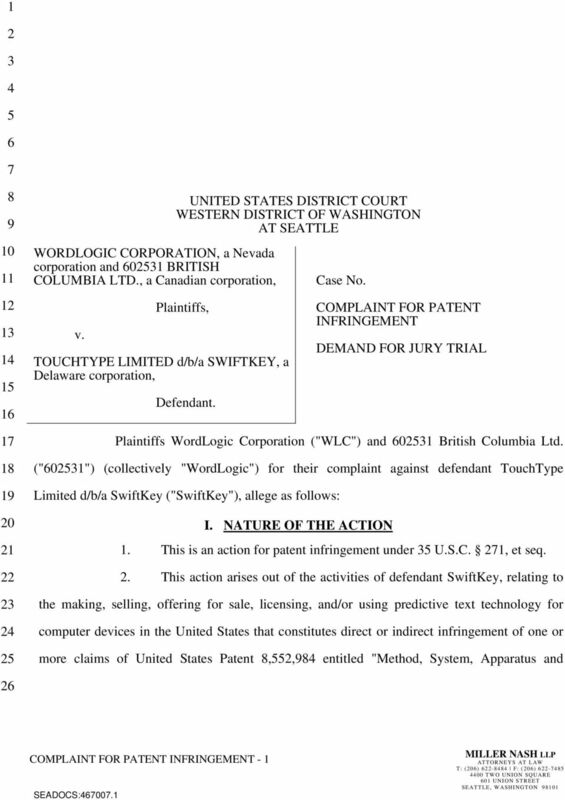 Plaintiff, High Tech Computer Corp., a/k/a HTC Corp., HTC (B.V.I. UNITED STATES DISTRICT COURT FOR THE EASTERN DISTRICT OF MICHIGAN. Plaintiff, Hon. IN THE UNITED STATES DISTRICT COURT FOR THE EASTERN DISTRICT OF TEXAS TYLER DIVISION UNILOC USA, INC. and UNILOC LUXEMBOURG S.A, v. Plaintiffs, RACKSPACE HOSTING, INC. and RACKSPACE US, INC., Defendants. 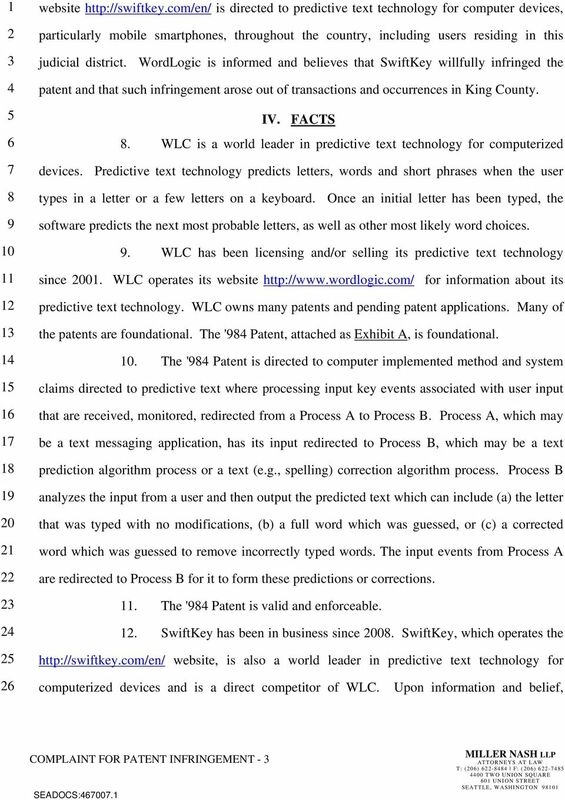 Case 6:12-cv-00799 Document 1 Filed 10/22/12 Page 1 of 14 PageID #: 1 IN THE UNITED STATES DISTRICT COURT FOR THE EASTERN DISTRICT OF TEXAS TYLER DIVISION INVENSYS SYSTEMS, INC. Plaintiff, C.A. No. 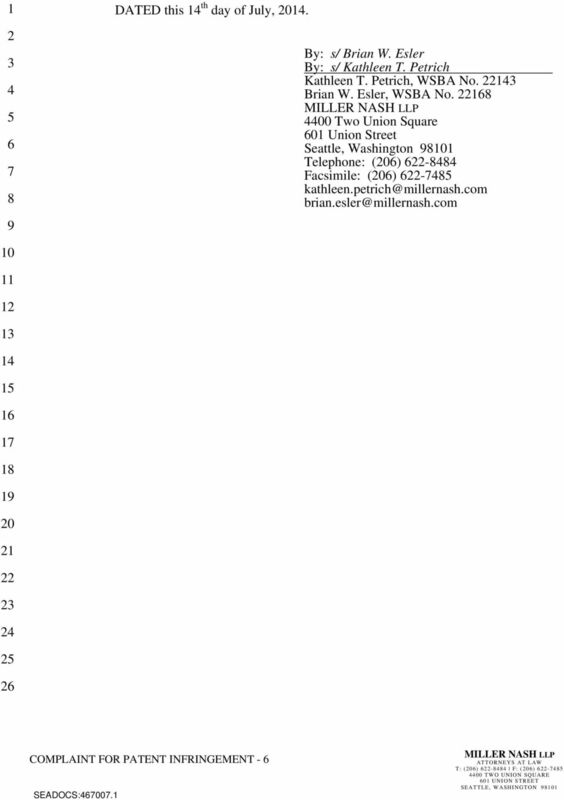 : v.
Case5:12-cv-00630-LHK Document261 Filed08/31/12 Page1 of 15. Attorneys for Plaintiff and Counterclaim Defendant Apple Inc.
Case 2:14-cv-01131-AJS Document 1 Filed 08/22/14 Page 1 of 11 IN THE UNITED STATES DISTRICT COURT FOR THE WESTERN DISTRICT OF PENNSYLVANIA INTELLECTUAL VENTURES I LLC and INTELLECTUAL VENTURES II LLC v.
Case 2:14-cv Document 1 Filed 09/12/14 Page 1 of 13 IN THE UNITED STATES DISTRICT COURT FOR THE DISTRICT OF KANSAS. v. ) Civil Action No. IN THE UNITED STATES DISTRICT COURT FOR THE DISTRICT OF DELAWARE COMMSCOPE, INC. OF NORTH CAROLINA and ADC TELECOMMUNICATIONS, INC., v. Plaintiffs, CORNING OPTICAL COMMUNICATIONS WIRELESS LTD., Defendant. UNITED STATES DISTRICT COURT EASTERN DISTRICT OF TEXAS MARSHALL DIVISION GLOBAL EQUITY MANAGEMENT ) (SA) PTY. LTD., ) Plaintiff, ) ) Civil Action No. v. ) ) AIRBNB, Inc. ) JURY TRIAL DEMANDED Defendant. Case: 1:14-cv-09680 Document #: 1 Filed: 12/03/14 Page 1 of 9 PageID #:1 IN THE UNITED STATES DISTRICT COURT FOR THE NORTHERN DISTRICT OF ILLINOIS EASTERN DIVISION NEOCHLORIS, INC. v. Plaintiff, Case No. IN THE UNITED STATES DISTRICT COURT FOR THE EASTERN DISTRICT OF TEXAS TYLER DIVISION. v. CIVIL ACTION NO.